I have to say, the premise of Undeadly excited me. Egyptians, zombies, boarding school and an extra-yummy side of reaper boy (A.K.A. – Rath)? Sign me up for this super cool combination of unique and fun story elements! And indeed, in the beginning it does seem to be just that. The set-up is just really different and reeled me right in. Imagine this: it’s modern day American, and while it closely resembles the world we know, there are a few glaring details. For instance, it has long been established that the old gods of Egypt are real and still take an active role in ruling humanity. Humans worship them, and in the case of Anubis at least, he has gifted a few humans with special… gifts. Anubis is the god of death, and so these gifted ones deal in death and the care of the soul. In addition to these special few, zombies, spirits and ghouls also are none too rare (the other major departure from our world). Yes, I said zombies. And the best part? They are literally a common household item. Dumb as posts, and sure if you don’t take care of them properly they might eat you… and they might kinda smell bad, but hey, they can fold socks and wash dishes like nobody’s business. Enter Molly Bartolucci. She’s a ka heka (which means she can make zombies. Yeah! I know!) works part-time at her dad’s family-owned Zomporium learning about zombification and care of said-zombies… and is about to turn sweet 16. And upon that special day, her life takes a turn for the utterly bizarre… which is saying a lot when you live under the same roof as your zombie uncle. Suddenly she’s bringing her almost-boyfriend back to life, finding out more about her so-called destiny, having strange dreams, meeting long lost family members, and being whisked away to a private reaper training academy, where she can be trained in the art of…well, reaping. Molly. She is cute, fresh, fun with a good heart with strong — though perhaps at times, misguided — convictions. Yes, at times she talked in a slightly alarming mash-up of textese and teenage slang, but I got used to it and think it adds to her charm. Molly is very much an authentic teenager – she isn’t a 25-year-old stuffed into a 16-year-old’s body. She has very teen reactions to situations, has a very teenage “this-is-my-microcosm” way of looking at things in the beginning. But as she learns more about what it means to be a reaper, the importance handling/mishandling souls – as she learns more about her role in the grander scheme – she begins to see how her decisions and actions affect her and those around her. Her character and voice is the most enjoyable parts of the book. Rath. Based on the fact that he’s mentioned in the blurb three times, I really thought he’d be in this book a bit more. What I saw of his character I really like, and I’d love to get to know his character better. But in reality, he’s barely in this book, and certainly not enough to establish much of a rapport between he and Molly. There are hints of a possible, future romantic connection in this first book, but honestly, the general lack of Rath? I’ll be honest, it was disappointing. When it comes right down to it, it’d almost be the same book without him. Story. While I enjoyed the build up of the world, I feel story-wise it took too long to get things really moving along; it could’ve been streamlined a little more and left more time for the story that came after. Ironically, and I’ll talk about this more later, but although it took a while for the story to really get moving, it did give Michele the chance to really work on character and relationship development, which is much stronger in the first third of the book. But when it comes down to it, character/relationship development shouldn’t suffer because the plot is moving forward, and vice versa. Anyway. back to the plot, it also lacks a sense of cohesiveness. There are several threads and mysteries running throughout, and I assumed they were going to connect somehow. Yet ultimately, it just lacked that something that made it feel like one connected story. I’m doing a hatchet job of explaining what I mean, but maybe it’d be better summed up this way: Undeadly’s plot lacks sophistication, at times feels contrived, and sometimes lacks direction. Tropes. I’m not one to automatically discount a book due to tropes. Even massive amounts of them. You know what I mean… single parent/absentee parent, the birthday-bestowment-of-super-duper-extra-special-super-powers, one parent isn’t who you thought they were, exclusive boarding school, the mysterious (and instantly captivating) potential love interest, the obligatory Mean Girl & Co., the ordinary becoming extraordinary, the reluctant Messiah, rags-to-riches… need I go on? Truthfully, I don’t mind most of them if they’re incorporated well within that particular story and, for the most part, they are included convincingly within Undeadly, but at times…? At times it was a teensy bit much. Character development. Besides Molly and a couple others… most of the characters are a bit on the cardboard side. There are a host of secondary characters filtering in and out of this story, but few with any depth or anything notable to make them particularly memorable. Relationship development. With the exception of Molly & Ally, Molly & her dad, and maybe Molly & Henry, the relationship development is pretty weak. Molly’s interactions with other characters are more often than not, superficial. There just isn’t enough time spent with any single person to really get a solid sense of Molly’s connection with them or to give reason as to why I, as a reader, should emotionally invest – it was a bit like a revolving door of secondary characters. Maybe there are just too many characters? Maybe a lot more happened off-page that should have been more heavily emphasized? Maybe more time should have been spent detailing life at Nekyia Academy, Molly’s classmates, etc. Maybe then, I’d feel like I had a better grasp of these people and their relationships with Molly? I don’t know. Overall. Unfortunately, for me Undeadly is a novel that falls far short of it’s brilliantly unique premise. Agreed! This book had so much potential and then it just fell short. Great review! I was looking forward to this book. It has so many elements I like, but it seems to have fallen short of many peoples’ expectations. I’m really hesitant to pick up my copy now. Thanks for the review! I know, I was reallylooking forward to this one too. 😛 I hope you give it a try for yourself to see what you think! Darn this sounded so promising. I know. 😛 It really did. This is in my wishlist.. would love to read this! Well then, I hope you get the chance to read it soon! The idea had so much potential but I agree, the execution was lacking. I gave it the same rating. Oh no!! This one seemed so original! I was hooked like you at first. Too bad it didn’t really deliver. Yeah. I think it had the potential to be something really amazing and it still was rather original, at least in concept… just wasn’t my cuppa tea. It seems like a good story. I’m sorry it fell short, but thanks for introducing us to the characters. Is this going to be a series? Maybe more will be told about each characters on the 2nd book. I was so excited for this book and I won it from a contest, but I have to agree that it feel short in a lot of aspects for me. One of my biggest complaints was how little Rath was in the book–there was so little progression in that relationship that the end of the book felt so disjointed. And the end of the book in general was just weird and confusing for me. 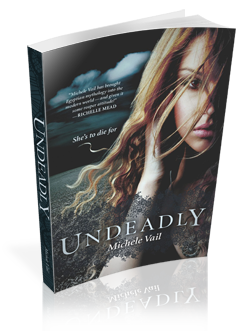 I still want to read the next installment, since I loved the snark and witty voice of Molly enough to hope that Michele Vail will fix her mistakes from this book for the next one. The first 3 days after I finished the book I was like… I loved it, but then I started to think about how much I didn’t like Molly’s voice, and then talking to Angela, it was like I had a better view of this story. I loved the story and the world created by the author, but I didn’t feel the connection, which was very sad!